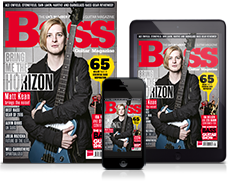 As firm Smiths fans, it’s fair to say the Bass Guitar Magazine team collectively came across a bit faint when hearing that former Smiths bassist Andy Rourke would be gracing their pages last year – so you can imagine their squeals of joy when he was confirmed as one of the headliners at the 2017 London Bass Guitar Show. If – like us – you’re dying to put further questions to this ever-cool bass legend, then get yourself over to the show’s ticket site now to secure yourself a seat at his masterclass. Have you got anything in particular planned for your Masterclass at the show? Have you attended such events before? "I’ve never done anything like this before, but I'm looking forward to it. I’ll be playing a few of my bass lines, answering questions from Joel McIver [editor of Bass Guitar Magazine], and then taking questions from the audience." Are you hoping to get out and make any purchases at the show? What’s on your shopping list when on the lookout for new gear? "I’ll definitely be having a good mooch around, maybe try out some new pedals, but I’m traveling straight back to New York after the show, so I’ll have to keep my purchases small so they fit in the suitcase." LBGS is known for its ‘wall’ of bass noises, with a friendly sense of competition often on display around the stalls. Do you have a ‘party-trick bass-line’ that you launch into when you enter a music store? Or is that a bit too much like showing off?! "I’m not much of a party trick guy although when I was younger there was definitely some healthy rivalry happening in the music stores." After doing Freebass [an all-bassist project with Peter Hook and Mani from the Stone Roses] a few years ago, you must be used to what happens when you get a lot of different bassists together in one room. Do you think there’s an ‘essential nature’ to be observed in the average bassist? "I don’t think so no, I’d say the opposite, every bass player is unique in their own way." LBGS is in many ways a celebration of the bass-playing community. Do you have any words of solidarity for other bassists struggling with band tensions/lack of motivation? "There is sometimes tension in a band, it’s the nature of the beast, you just have to get on with it and try not to escalate the situation. "Regards lack of motivation; that is something that comes from within, you have to remain positive as much as possible." "That would be my 1964 P Bass I bought it in New York in 1982, it’s been with me ever since." If you could only listen to one other bass-line for the rest of your life what would it be? "The baseline from ‘I Was Made To Love Her’ by Stevie Wonder – it’s fabulous!" Do you get pre-event nerves? Have you had any hairy moments onstage or prior to performances that you wouldn’t mind sharing? "I do get very nervous beforehand but once I’m onstage I’m fine, getting on stage can sometimes be a little difficult if the lights aren't up. "I once went flying head over heels over a stage monitor as I walked on stage – not one of my best entrances and it kind of threw of my concentration for the rest of the gig." D.A.R.K, with the Cranberries’ Dolores O’Riordan and Ole Koretsky. 2016 saw two notable projects from you – Daddy [with actor James Franco] and D.A.R.K [with the Cranberries’ Dolores O’Riordan and Ole Koretsky]. Will there be any more coming from them, or will they remain as one-off projects? "I’m in LA at the moment working on a project with Kav Blaggers, former guitarist from Happy Mondays and Black Grape. It’s sounding really great although we haven’t settled on a name yet. "In terms of the D.A.R.K project, we are in writing mode at the moment although our schedules are all over the place. Dolores is busy with a Cranberries tour and I’m here working in LA. But we have a few ideas already. Watch this space is all I can say. "The Daddy project was a one-off, but I continue to write with Timothy O’Keefe, the main songwriter in Daddy. We are working on various writing projects together including composing the music for the Anthony Bourdain series called Raw Craft." Andy Rourke will be performing and speaking at the London Bass Guitar Show 2017 on March 4 and 5. For information, visit www.londonbassguitarshow.com, www.facebook.com/londonbassguitarshow or @bassguitarshow. We also have a 20% discount for MusicRadar users! Simply visit http://www.londonbassguitarshow.com/buy-tickets/, type in the code 'MUSICRADAR' and your discount will be applied.